This article is sponsored by WRRYFree Skin Care: products that are clean, safe, and effective for all ages. As a special gift to the readers of Health Your Way Online, we are offering a 10% coupon discount to bring in the new season! Get the most out of your summer with the Bug Drug, our super-effective and DEET-free insect repellant, and Climb On! brand sunscreen. An additional product to always have on hand is our popular Climb On! Bar and Crème. Well-known for its amazing healing properties from everything to cuts, scrapes, to dry skin and eczema. To redeem your savings, visit http://WRRYFreeSkinCare.com and use the code “HealthYourWay” before August 31, 2012. Summer is upon us! Are you hiding behind a slouchy T-Shirt or are you rockin’ that new summer bathing suit? Look and feel confident this summer with these 5 “Beach Ready” moves! To maximize your workout time try combining your exercises or do full body strength exercises to tone and trim. You do not need a lot of expensive gym equipment to look great! Get your sweat on at the park or in your own back yard! No excuses! Place your right foot on the bench or chair. Your thigh should be parallel to the ground and your hip at a 90 degree angle. This is your neutral position. Push yourself up and off the bench/chair jumping into the air, releasing your supporting leg off the ground, left knee coming up forward and land on the right foot on the bench/chair coming back to your neutral position. At the same time, use your arms, swinging them up and forward straight over your head with each jump. Keep core tight and engaged during the whole exercise. *This move will tone and tighten your lower body while raising your heart rate up to burn calories! Try a set of 30 seconds on each side to begin. Crouch down, bending your knees and placing your hands on the ground. Crawl out to a full forward plank with your hands as fast as you can. Twist to side plank lifting your left arm/hand to the sky then place it back into forward plank. Repeat the twist to the right and return to your forward plank. Finish the inchworm by crawling your hands quickly back in towards your feet and stand up and jump into the air. Repeat the whole sequence. 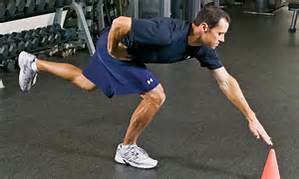 *Another great full body move to strengthen your lower body, arms and core; not to mention kick your heart rate up a notch! Try a 60 Second Set. Bend and squat down with all of your weight well into your heels leaving your arms still, stick your seat out as if you were going to almost sit down on a chair. As you come up out of the squat and stretch your knees give your seat muscles an extra squeeze as you stretch your arms overhead at the same time and bring your weights together (military press). Keep back straight and abs tight. (No arching in the lower back). Tight abs will help support your back. HINT: You can also change this exercise and target your inner thigh muscles by changing the regular squat to a sumo squat. Starting position would be feet slightly wider than your hips with your toes pointed slightly outwards. Ensure your knees follow your toes as you bend into your squat. *Combining your strength moves will help to lessen your workout time! Try a set of 12-15 reps. Sit on a bench or chair. Put your hands on the bench (hands tight into your seat) with fingers pointing forward grabbing the edge. Walk your feet a few steps forward releasing your seat from the bench. Bend your elbows so they are pointing straight back (all weight should be on the back of those arms) Stretch your elbows and return to your starting position. *Wonderful for toning those arms! Try a set of 10-12. ATOMIC PUSH-UP: Kneel on floor behind your stability ball and walk forward over top of the ball into a good forward plank position. (Beginners walk out so that your knees and lower thighs are still touching the ball) If you are more advanced, you may walk out a little further with more weight bearing into your arms. Ensure no arching in your lower back. Crunch both knees evenly into your chest and crunch your ab muscles. Return to your beginning plank position straightening both knees. Do 1 full push up, nose towards floor. PIKE/JACKKNIFE: From the same plank position above, keep your knees straight rolling the ball towards your feet and draw your seat up into the air (making a triangle shape with your body)squeezing your lower abs. Return back to the original plank position after a good 1-2 second hold. *Try a set of 5-6 to start. This article is written by Crystal Reia, PTS, PFS, OAS, Personal Trainer and Owner of Your Health-Your Choice, Kitchener, ON, Canada. www.yourhealth-yourchoice@live.ca, www.facebook.com/URHealth, Twitter: @URHealthURChoice.